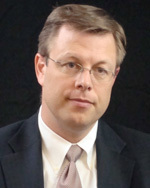 Clark Gilbert is the president and CEO of the Deseret News Publishing Company and Deseret Digital Media. Prior to DDM, Gilbert was an associate academic vice president at Brigham Young University–Idaho, where he oversaw the university’s online learning and distance education initiatives. He was also a professor of entrepreneurial management at the Harvard Business School and has a background in media innovation. At the Harvard Business School, Gilbert published numerous award-winning articles on innovation, including lead articles in the Harvard Business Review and MIT/Sloan Management Review. Gilbert has served on the New Ventures Boards at Landmark Media and Scripps Publications. He was a founding partner of Boston-based consultancy Innosight, where he built an advisory practice with media and healthcare clients targeting disruptive innovation. Gilbert graduated from Brigham Young University. He earned a master’s degree from Stanford University and a doctorate degree from the Harvard Business School.